Variations in seismic Q are sensitive to a much greater extent than are seismic velocity variations on factors such as temperature, fluid content, and the movement of solid state defects in the earth. For that reason an understanding of Q and its variation with position in the earth and with time should provide information in earth's tectonic evolution, as well as on aspects of its internal struct… ure. Progress in understanding Q has suffered from difficulty in obtaining reliable amplitude data at global and temporary stations. Moreover, laboratory determinations of Q, until recently, were most often made at frequencies much higher than those measured by seismologists for waves propagating through the earth. Recent advances in seismic station distribution and quality, as well as in methodology at both high and low fequencies, have greatly improved the quality of observational data available to seismologists from global stations. Concurrent advances have been made in measuring Q using laboratory samples at frequencies that pertain to the earth and in theoretical understanding of seismic wave attenuation. 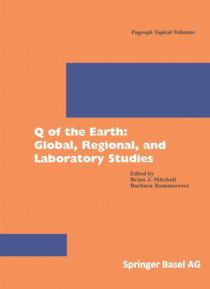 Papers of this volume present new information on Q in the earth from several perspectives: methodology, results from global and regional observations of both body and surface waves, laboratory measurements, and theoretical understanding. The editors believe that we have reached a new threshold in Q studies and that advances in data quality and methodology will spur increased interest in this difficult, but interesting field.